I am trying to understand some more about Chinese poetry of the Tang period. I haven't got very far, but what I have picked up is so interesting that I thought I would pass it on to readers of OnFiction. My source is Stephen Owen (1985) in his book on Chinese poetics. Here—with apologies for misunderstandings which I hope knowledgeable readers will correct—is some of what I have gathered so far. In the West we tend to think of poetry as an act of the imagination and even, as the Romantics urged, an act of extraordinary imagination, inspired by the gods. Tang poetry isn't imagination, but an interpretive perception by a particular person at a particular historical moment in a particular place. It occurs because of an inner emotional pressure (huai) to make conscious with concern and strong feeling what is on his or her mind, to make a communication to another human being. What is written in a poem is a particular kind of pattern in which aesthetic significance and meaning are conjoined. 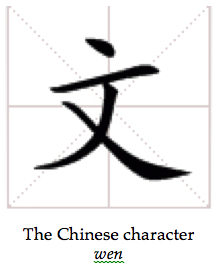 Such a pattern is called wen, which is also the word for writing, and also for literature. It is the "civilizing force of culture" (p. 18). Rather than being based on metre and rhyme (as in the West) poetic patterns of this kind are usually written in couplets, in each of which the second line parallels the first so that the relationship between them draws on, and clarifies, an inner principle. Owen's first example (p. 12) is a four-couplet poem by Tu Fu (who lived between 712 and 770). Its title is something like: "The poet writes of what he feels, traveling by night." Here is Owen's translation of the first couplet. Each word is written as a single Chinese character, and there is a parallelism not just between the lines but between the two characters in the first pair, the two in the second pair, and so on, for instance between fine/thin and high/precarious. (The carefully calligraphed Chinese characters, their etymologies, and their specific associations also have relationships with each other.) Not only that, says Owen, but the first and second half of each line need each other: "they act on each other according to the laws of the empirical universe" (p. 17). So in the first line there is a hidden image of the fine grasses swaying in the faint breeze. At the same time, the boat's mast is precarious, seemingly threatening to fall with the rocking of the boat, so that the poet feels anxiety, alone at night, while on the shore people are safe in their houses. I take it that what Owen calls parallelism is what Jakobson (1956) called metonymy: juxtaposition that can be based on similarity, on contrast, on a part suggesting the whole, or on any other kind of mental association. Just as principles of the world can be perceived in such patterns (wen), so, says Owen, the conscious human mind can manifest itself in these same patterns, and poetry is one such manifestation. There is nothing here of poetry being mimetic, nothing of the Platonic idea of truths existing only in some ideal, other-worldly, realm. Instead, a particular piece of literature emerges naturally from the conjunction of some aspect of the world with an aspect of human consciousness, so that the writing (wen) is the manifestation of that conjunction. A reader of such poems then, works backwards from the words of the poem to the specific mental state of the poet as he/she is writing the poem, and can then engage, like the poet, in a comparable piece of reflective consciousness. Four-couplet poems such as "The poet writes of what he feels" have turning points, midway through them, of a kind that in the West would later be embodied in the sonnet form. At the turning point in this poem, the poet moves from his perceptions of the outer world to inside himself, to reflect on how he is getting sick and old, and has to give up his post, so that even with his writing he will be unknown, like a single gull on the sands. This is just a beginning: I am brooding on Owen's book. Apart from marvelling at the beautiful compression of thought in the structures of these Chinese poems, I have already started to look at the world in ways that are new to me, ways that I find engaging. I have read the book only once. I shall read it again, along with some more Tang poetry. Note. Ezra Pound became interested in Chinese poetry and made translations of it in ways that were influential in the imagist movement. Owen makes it clear that it's not with such translations that he is concerned. Although the early twentieth century movement of imagism drew on some aspects of Chinese poetry, it is also not with imagism or its ideas that Owen is concerned. Instead he invites us to take a leap of imagination into what it might be like to inhabit the minds of these ancient poets. The closest Western parallel I know is in Proust's depictions of things and people in themselves and at the same time in their inner meanings, meant to be passed on to readers. Roman Jakobson (1956). Two aspects of language and two types of aphasic disturbance. In R. Jakobson & M. Halle (Eds. ), Fundamentals of language (pp. 53-83). 'S-Gravenhage: Mouton. Stephen Owen (1985). Traditional Chinese poetry and poetics. Madison: WI: University of Wisconsin Press.